It’s been a good week, and I’m feeling settled enough in the studio now to get my head down for some decent work. Whilst moving all my books onto the studio shelves I rediscovered the work of Mark Boyle in an old Tate Liverpool sculpture catalogue. I’ve always been really fascinated by his street studies - chiming as they do with quite a few of my own recent obsessions. A Google search has just told me that Boyle is sadly no longer with us (he passed away in 2004), but he was an influential figure in the UK Underground movement of the 1960s – remembered as a pioneer of light shows in rock music (for people like Soft Machine and Jimi Hendrix), as well as an early UK exponent of performance art. 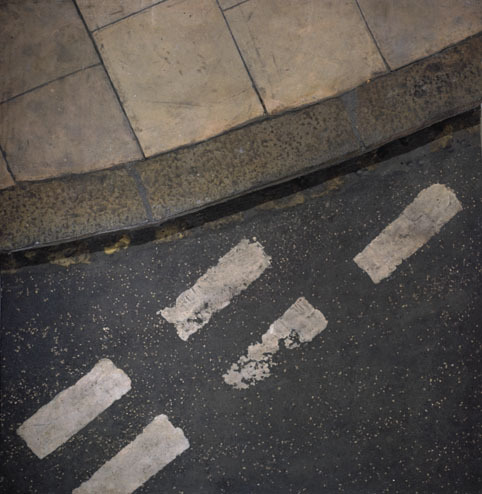 The late 1960s also saw him working on a series of large sculptures of random areas of London pavement, reproduced in trompe l’oeil fashion using epoxy resin and fibreglass, and hung on gallery walls like unframed paintings. Boyle wrote that the technique “involves lifting the movable material on each site and holding it in the same shape until we can back it with a precise presentation of what lay underneath (i.e. the immovable material). In some cases the presentation is microscopically accurate.” In other words the original dust, detritus, fag butts etc are retained in the final sculpture. I like the notion of preserving and presenting anew the pavements we all walk across day after day – looking at but never seeing.